Hello, friends! I just want to take a second to say I’m sorry for the delay since my last post. I’ve been out of town visiting family and now I’m way behind schedule. However, since I’m not working this week, I should be getting right back on track! Now, on to the review. Another issue I had with this was that I found the major characters to be extremely unlikeable. While this isn’t necessarily a deal-breaker for a book, if it’s not bringing something really interesting to the table, then at the very least, I need someone who I can root for. Our House did not deliver in this regard. Bram is horrible; he is a sorry excuse for both a husband and father, cowardly, impulsive and childish to the extreme. Fiona is naive, kind of oblivious, and uptight. The two of them as a couple strain the limits of credulity. Granted the novel is predicated on the two of them splitting up, but how they became a couple in the first place is beyond me. Bram is a compulsive rule-breaker and Fiona thinks a speeding ticket is a horrific black mark on a person’s character. These two stayed together long enough to have two children? All that being said, I do think I could have loved this book were it not for the sluggish pace. It opens strong, and we are thrown right into the action, with Fiona coming back to her house to find strangers moving into it and Bram MIA. This is followed up with the opening of a confession letter from Bram, so we know very early on that he is responsible but are given no inkling as to why. I had very little idea of what to expect from there, and Candlish throws in so many twists and turns that you’re guaranteed to be surprised more than once. Thank you for reading! 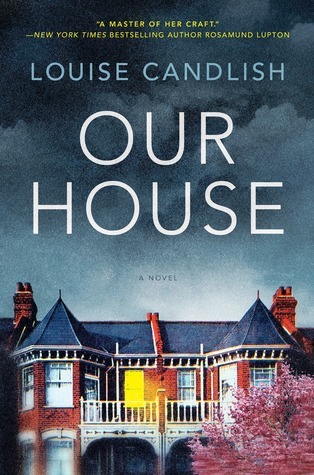 Have you read Our House? Please share your thoughts in the comments!